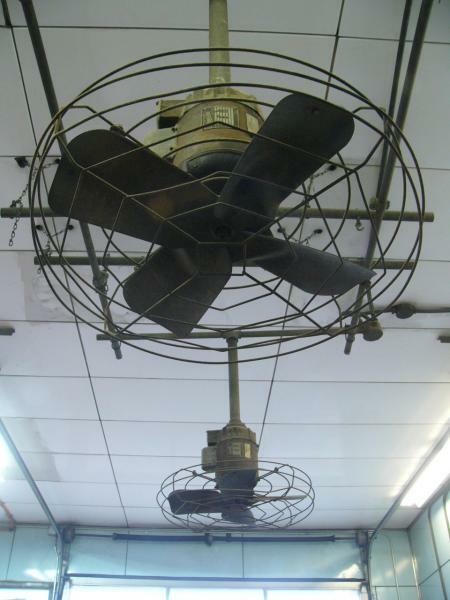 AFCA Forums > Antique Fan Collectors Association > Post-1950 (Vintage) > Unusual ceiling fan, has anyone seen one of these? These are at a local store, I have never seen anything quite like these. They are very sturdy looking and have what seems to me a massively over-sized motor on them. Only had my phone with me so I couldn't get a great closeup of them. 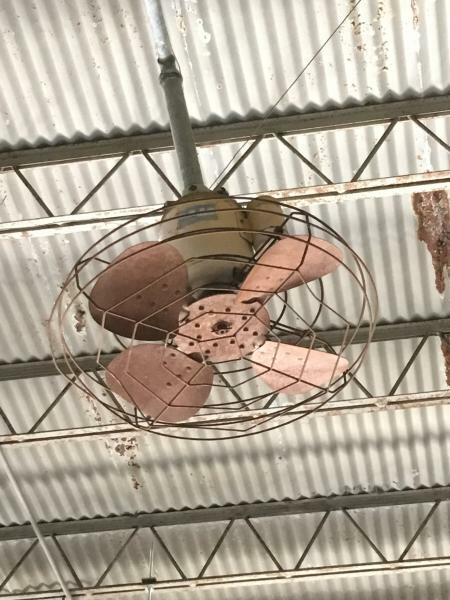 I wasn't able to see them running, they have been disconnected and replaced by an HVLS fan seen in one of the photos. Anyone have any idea what these are? Really neat. It's hard to get an idea of the scale of them in the pictures. How large are they? Look sort of like air circulator fans that have been mounted on down-rods. If I were you, I would keep on the building owner to give / sell them to someone who will appreciate them since they are not in service. My best guess is that they are 30 inches in diameter. I’m going to make contact with the owner ASAP, I just stopped by real quick today to snap a picture of them for you guys before I went to work. Wow, those are large. Wishing you luck getting them! This Emerson box fan that Larry Hancock has is the closest thing I can find so far. The blades and hub look very similar. The fans in my pictures may be slightly smaller than 30 inches. Its hard to tell when they are all the way up there! They are definitely large though. There doesn't seem to be much info on these old air circulators. 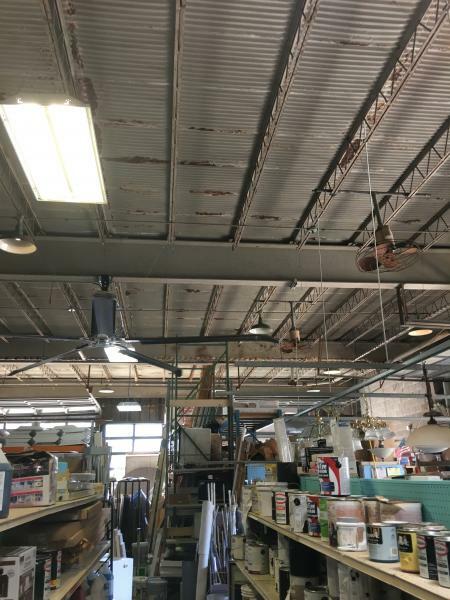 I have a large belt driven exhaust fan that has the same style blade and it says on it Murray Co. of Texas inc. Cool! Do you have a photo of it? Considering these are located in Texas, that manufacturer seems a likely candidate. Its been installed high in the side of our shop building, higher than this old man can get. But i bet its the same company. Thanks for the info Raymond! Looks like Murray Co. has a lot of patents for cotton handling/processing equipment. Interesting. I think mine is from the early 50's, It will be interesting to know what it says on that motor tag if you get them down. I really hope I can get my hands on them. I'm very interested to see how they've designed the motor/bearings to handle being hung like they are. I wouldn't imagine that blade-set is lightweight at all. Seems like that would have to be a pretty special purpose motor. Maybe it has some kind of taper roller bearing in it. Those are interesting Andrew, are they in Seguin? Any idea what the building originally was? Yes these are in Seguin. My best guess is that the building was a car dealership. Some kind of business that required both a reasonably sized showroom and a large garage area. The building looks like it might have been built in the 1940's or 1950's. It has a small second story which I haven't seen yet. I believe the fans are original. Upon further investigation, it has a 4000 5000 sq ft air conditioned basement too. Maybe it was some kind of pre-walmart department store with an auto shop. Apparently a lot of people have occupied the building since it was built, many recently. It is amazing those fans are still in there. I'd love to see their HVAC system. Its bound to be fairly old as well. 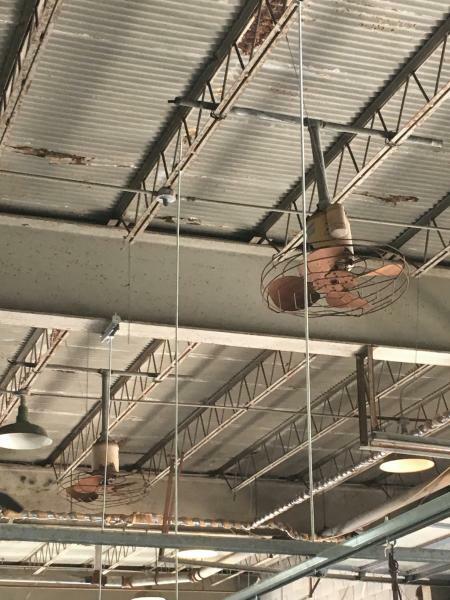 I finally found the guy who is in charge of the ceiling fans, he was thrilled that I was interested in them. He has plans to take them down within the next month or so while performing other maintenance on the ceiling. He happily agreed to sell them both to me! Once I get them ill post some closeups so we can figure out once and for all what these things are! Fantastic Andrew, you need to drop one off over here! Russ, those look very similar. The cage is identical. What are those? Andrew White wrote: Russ, those look very similar. The cage is identical. What are those? I don't know who made them. Pictures were taken in Iowa at a service station years ago. They are very industrial looking. Thanks for sharing the pictures. Very interesting to see them used in the same type of environment--in a matching pair no less! They are clearly not common. Yours and the ones I came across are the only ones I've ever seen in my life. I am familiar with old downdraft electric garage heaters but air circulators in this configuration are foreign to me. At my dad's fire station (built in the 60's) they have a couple of pretty old Chromalox heaters mounted in a similar fashion that kept the water in the fire trucks from freezing. Those things put out some serious heat. Page processed in 0.2459 seconds (35% database + 65% PHP). 31 queries executed.